The Results Are In: How Do You Wish Your Company Showed Appreciation? For many, the holiday season means receiving gifts at work. 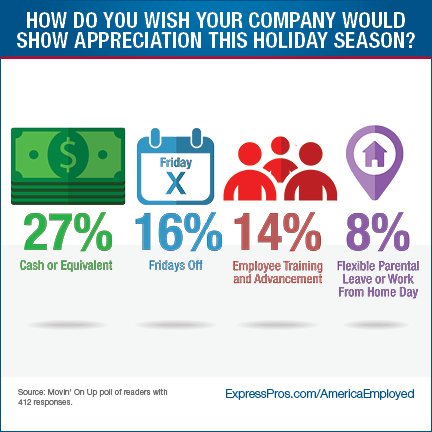 From cash to time off, there are multitudes of ways companies decide to show appreciation to employees. In a recent poll, we asked Movin’ On Up readers how they wish their employers, or future employers, showed appreciation this time of year, and the results are in! Tickets to movies or other entertainment events received 13% of the vote, followed by “a flexible parental leave plan or work from home day” with 9%. Additionally, 6% of respondents would most appreciate a massage, and 2% would welcome a rotating trophy of appreciation. These results don’t greatly differ from last year’s, which revealed that 29% of respondents would most appreciate a cash bonus, followed by 23% who selected pay raises, and 16% who chose days off. Likewise, last year’s results also revealed that a simple note of appreciation would speak volumes to the workforce. In fact, we’ve seen a steady rise in the number of readers who value appreciation from their supervisors. In 2014, 31% of readers wrote that they wanted appreciation. In 2015, that number rose to 42%. This year, the number again rose to 50%. These results reveal that some of the most powerful gifts may be the easiest and least expensive to give. How do you wish your company showed appreciation? Share with us in the comments section below! Previous Post Poll: What Are Your Job Market Predictions for 2017?